It is easy to feel like you are the only one facing these struggles and that no one understands. The more you talk about mental health the more you’ll realise you’re surrounded by others on the same journey that can support you. Even you being here reading this, you have the option to email me for support, join a supportive Facebook group full of women facing the same struggles and reach out for the support you need. I know it can be hard to initially reach out and admit something is wrong and that you need help. I’m going to share with you a story of the day that I made that realisation and finally made an appointment with a doctor. It’s the best thing I ever did and although it’s hard I cried through the whole first appointment I wouldn’t be where I am today without it so I’m so glad I did. I hope this post can give you the strength to do the same. Today I will be covering anxiety and depression, both of which I have had personal experiences with and received counselling for. To find out more about managing other mental health problems visit this website. For years I didn’t really know it was anxiety. I went through school and college feeling shy and lacking confidence. I really struggled in social situations but I just thought this was normal and every girl felt that way so I carried on. When I left college and got a job in childcare the feelings continued even though I felt confident in my job and my ability. It stared to get worse in social situations. I remember one time at a Bowls tournament I became so anxious that I felt sick and dizzy. So scared because I had never felt that bad before and that’s when I knew maybe there was something more. I ended up going back to the hotel and spending the rest of the day in bed crying not knowing what was wrong with me. This continued over the next few months and the feelings got worse. I began to push my friends and family away and feel even more alone than I did before. The day came when I was at a supermarket with my sister and she went off leaving me alone. I remember feeling completely lost, scared and I didn’t know what to do. When I got back to the car I called the doctors to make the appointment. I could hardly speak on the phone I was so upset and scared about what was happening to me. The doctor referred me to see a counsellor once a week and after the first session and filling out a questionnaire I was diagnosed with severe anxiety and depression. I felt completely lost, alone and upset, I felt labelled, embarrassed and scared to talk to anyone about it. I didn’t know whether to even tell my family and friends because I worried about what they would think about me. The counsellor was amazing and gave me some great advice, introducing me to personal development which has since completely transformed my life. This is definitely the most important one, if I hadn’t spoken to my mum regularly about how I was feeling as well as the counsellor I doubt I could have got through it. Even if you feel there isn’t someone you can talk to you can email me and I’ll listen to you when you need it. Think about the people you spend the most time with. Are they positive people? Do they make you feel happy and worthy? If they don’t reconsider spending as much time with them. I know this can be easier said than done especially if it is a family member but remember your mental health has to come first and if someone’s attitude is having a negative effect on your mental health you may need to reconsider the time you spend with them. Also start to be aware of what you spend your time doing and watching. For example are you starting your day watching or reading the news? Taking in all that negativity and disasters from around the world? Are you gossiping about other people with your friends? Watching horror films or soap operas that are full of arguing and drama. Spending your time surrounded by these television programs can have a negative impact on how you feel and your mood. Especially if you suffer with anxiety you don’t need the added worries of the negativity going on in the world. Other ways include any personal development habits – journaling, affirmations, meditation and exercise. Fill your mind with positivity. Listen to podcasts and YouTube videos, read blogs and books and surround yourself with positivity. I truly believe Personal Development is the best way to manage depression. I was put on anti-depressants and I didn’t see the benefit you would expect. (This is not to say you shouldn’t take them. Always seek medical advice before coming off anti-depressants). My counsellor recommended the book “Finding Peace In. A Frantic World” it introduced me to the world of personal development and I began exploring and trying everything I could. Now my daily routine consists of many habits that continue to manage and keep away my depression. I don’t go on my phone for at least the first and last hour of the day. This gives me time to focus on myself and get my personal development done before opening myself up to the rest of the world. I find that when I go straight on social media I’m more likely to fall into the habit of comparing myself to others and feeling negative about myself and my life which as you know can lead to a dangerous downward spiral. I always start my day reading a personal development book. There are so many that I have found really valuable. Some of my favourite books are Confidence by Katie Piper and The Anxiety Solution by Chloe Brotheridge. If you want to get started without spending money you can read blog posts. I then take some time to write down anything that is on my mind, positive or negative. Even if it is just a huge to do list it clears my mind and allows me to focus and feel good for the day. 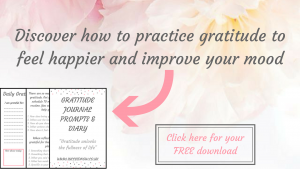 It is also a good idea to write down things you are grateful for. This gets you thinking about everything you already have in your life rather than the things you want. Have a go at creating your own and saying them to yourself daily. If you prefer you can record them on a voice note on your phone to listen to them daily. Or try writing them down everyday in a journal or notebook. I love starting my day with exercise, it can give you a huge energy and mood boost and get you ready for the day. It is as good for your mental health as it is your physical health and has been strongly linked with managing depression. You don’t need to join a gym or start running. Simple using what you have in your house (stairs, sit ups, lunges etc) is a great place to start. “Some individuals experience the symptoms of depression throughout their lives that is resistant to treatment such as antidepressants or ongoing therapy which is known as Treatment Resistant Depression (TRD). Heather is a Mental Health Blogger and Therapist. 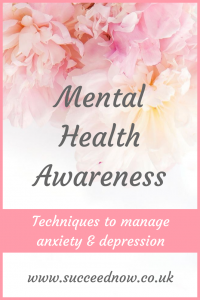 To get Heathers amazing E-Book on Anxiety click here. Would you like some extra support with managing your anxiety and taking back control of your life? Head over to the Mindset Mastery for all the resources and support you need to manage tour anxiety, overcome fears and build your confidence. Click here for more information. I have struggled with mental health for many years, and its great to see more blog posts like this spreading awareness. I love it! I really have to try some of the tips. I get bad anxiety as well, and it is not fun! I’m so glad you have your anxiety under control. I agree that it’s great to see people opening up about mental issues and spreading awareness about it. Journaling is a great way to battle anxiety! Great ideas shared here!